Last night, not long after the mosque attacks in New Zealand, Ocasio-Cortez attacked the ‘thoughts and prayers’ of people as well as the NRA. This wasn’t even in America, yet she attacks the NRA. She also attacks ‘thoughts and prayers’ because she truly believes only government is the answer for everything. Democrats have become so radicalized in the last few years that they politicize everything before they even know the facts. They want to get rid of guns and they’ll use any occasion to argue that point, even when it has nothing to do with America. This women is a friggin’ MORON. But every time she opens her mouth and says something, invariably it helps the Republican cause. So, even though it’s excruciatingly painful to hear her speak, I’ll put up with it. I’m inclined to agree with her: those Muslims had no business praying. New Zealand has very tough gun laws, so She Guevara tries to put this on the U.S., while playing nice with a foreign PM she really knows nothing about. Ardern is a fellow democrat socialist who calls capitalism a failure. However, Ardern has also called for a reduction in immigration. The same reason Pelosi does it. Optics. It’s a slap in the face to actual Christians. I dont know why, but the article image of AOC, reminds me of a before and after with Nathan Phillips. Don’t go away mad Mz Kotex – just go away. AOC, the gift that keeps on giving….. But I don’t want THAT gift! Condolences and prayers to the families of the victims. Many religious people find it comforting and consoling to approach God in prayer and know that he is the source of true comfort and peace for them. Now for my gun “conversation”: The murderer in New Zealand was a deranged psychopathic killer. Ocrazy-O doesn’t seem to grasp the concept that gun laws, no matter how stringent, don’t deter determined killers and/or criminals from getting and using guns. We know that all the gun laws in the world don’t work in places like the U.K., France, Washington D.C., and Chicago, Illinois. Even if you get rid of guns (and ammunition) altogether, other weapons or things that can be made into weapons are available. Not to mention the chief weapon of choice by Islamic killers, explosives. She’s a communist and doesn’t even believe in G-d. I’m sure of it. My sources are telling me that that was not ashes on her forehead, but holy water. It apparently caused third degree burns. SisterMary Are you insinuating that a house fell on her sister? I’m sure she’s just trying to connect w/ every faction of her (imagined) base. Oh, just shut up already. Since there so obsessed with late term abortion, I’d like to propose a bill. Occasional-Cortex is a nitwit who needs to learn to occasionally keep her mouth shut. She really has become full of herself since her term in congress began, and she feels the need to flap her gums and pontificate on every subject. I wish conservative media would just ignore her. The more we mock her, the more the left turns her into some kind of martyr. We should skewer th’ gizzard o’ this salty sea bass o’ a wench. Th’ strumpet must be made t’ walk th’ plank! Congratulations Kentucky for going gun permit less carry. 16 states have this and more should. @Kram RKBA and permitless carry in Iowa were killed by the Parkland shooting, but we’re still working on it. Interesting…that O’crazio never considers just keeping her mouth shut. Charli She can’t, it’s against her religion: The Worship of AOC. The Brains Behind AOC – I watched this yesterday and I find it of utmost importance. I am far too simple of a person to sort out if this is fake but it explains so much to me about AOC’s rise to prominence from working in a bar to a seat in Congress. This should really go viral if it’s accurate. It’s totally true. An immature, empty headed bartender wouldn’t have known the first thing about campaigning and running for office. They picked her, groomed her, told her what to do to win her primary, and are telling her what to do and say everyday she’s in office. You’d think the people behind her would be smarter though! Similarly, Michael Knowles had an Op-Ed on Foxnews about how AOC’s ignorance and stupidity is truly the problem and that entrance fraud is merely one of many symptoms of a failed educational system. TERMINATE DEPT OF ED! But this is then very scary for our country. As the video tells it, they had good success with their last campaign and plan to go forward with multiple hundreds of similar campaigns. With our young people being so empty headed, full on illegal immigration of people that have no understanding of our Constitution, lowering the voting age, and allowing illegals to vote, we could have a whole Congress full of these puppets. Glenn Beck’s The News and Why It Matters segment last night displayed in a short video clip how this woman cannot answer a question off script which points out that it’s the puppet master coming up with her Green New Deal, running her twitter account, and feeding her the role she must play. Could this be what’s behind the Beto phenomenon? I agree, ProLifer, and I have copied the URL and sent it to everyone I know. It certainly explains how this bar tender came out of nowhere to become the best known person in the House. This is something both demonrats and GOP need to notice and expose immediately. THANK YOU! Soro’s must be so proud. Funny how Trent claimed 60 million make < 20K then she goes and turns it into 200 million, and they both claim that's 40% of the country. First, that 60 million probably includes a lot of teenagers, and if it's 40%, our population is 150 million. And if 200 million is 40%, then we have 500 million residents. Their math ability is pitiful! Both of these figures are false. Unless she knows something we don't about the numbers of illegals being way, way higher than reported. THANK YOU FOR SHARING THIS! I am sending it everywhere and suggest we all do the same….FB, Twitter and ever networking site we visit. This is HORRIFYING! That explains a lot about her. Explains a lot about all demoncraps. Someone posted this a few days back, it is very enlightening. And, if true, very unnerving. But many people can be bought, and I’m sure those elected to gov’t positions are not immune. I hadn’t seen it before and probably others haven’t either. So it’s good to keep posting it until the video has tens of millions of views. Thanks for letting me know. I am thinking this same scenario is why Beto is rising to the top so fast. Just a few months ago he said it wasn’t fair to his family to run and now here he is – the media darling. To me, the thought of a puppet government is very unnerving indeed! ProLifer If this is true it’s downright frightening…it not only shows how we got ocrazio…it makes one wonder if this is how we got obama. I don’t usually buy into videos of this sort but this one is making sense. It’s also scary if they replace all the Dems, because while the GOP occasionally can withstand the current Dems, the GOP’s weakness under pressure is no match for these fervent Justice Democrat ideologues. More words of wisdom from the democrats’ glittering jewel of colossal stupidity. Just shut up you braying jackass!!! The only thing being deflected here AOC is your Communist ideology. Ashes don’t make you a Christian any more than owning a Bible does if you don’t read it. sjmom The fact that anyone can attend an Ash Wednesday service and receive ashes, i.e. you don’t have to be Catholic, is not something that’s well known. I’m Catholic, and was not aware of this. There should rarely, if ever, be policy changes during tragedies. Nobody is ever thinking straight. Emotions are running too high, and people are too scared and too angry to be trusted to make rational decisions. I swear if I ever get the power, I’m going to make that the 28th Amendment. Mandatory six month cooling off period before policy changes based on tragic events are allowed to be introduced in Congress, implemented through Executive Order, or by Agency rule. I’m there with you, but there have to be exceptions, like attacks on our nation and declarations of war (which oddly never happen anymore) can’t be held to a six month period. Exceptions only in the case of unanimous consent. That is, 535 Congressmen plus 1 President. It better be that damned important and crafted so perfectly that everybody can be on board. Because if they’re not, then someone is going to be exploiting tragedy to start playing an angle. It happens every time, and I’m f-ing sick of it. We have got to stop being a reactive nation and society, and we have to start using our damned brains. Two thirds or three fourths majority. No matter what the subject, there is always some idiot who will be against it. There are already too many America Haters in Congress. Good. Let America see who the obstructionist morons are so that they get kicked out that much faster. And the damage that could be done to our nation while this plays out or is successfully stalled could not be undone. That’s why unanimous consent is pretty much never a requirement. The damage that could be done because of knee-jerk reflexive policy change is worse. This is not unexpected – especially from this dim-witted little turd. Doesn’t stop me from wanting to physically express my ire over the crap she’s spewing. What an absolutely ugly, miserable little moron she is. THIS is how you get physically attacked or a target on your back: attack a peoples’ belief system. For now, I guess we have to pat her stupid head and turn the other cheek. 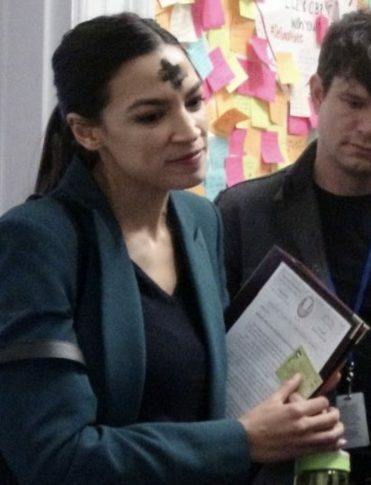 I believe the picture with the ashes on her forehead is enhanced! Most parishioners have just a quick smudge when the Priest makes the sign. I think that she got some additional ashes out of the fireplace. Besides, I think she’d burst into flames if she came in contact with the Cross. New Zealand is an anti-gun, gun free zone. A country with Draconian gun laws. Well, it’s not quite as bad as some. You have to jump through some hoops, but ultimately NZ is a “You can have them if a bureaucrat decides you can.” And we all know how good the judgment of bureaucrats is. Does anyone recall if the gentlelady from New York’s 14th congressional district ripped the NRA a new one after Muslim Fulani herdsmen, in Kaduna state, Nigeria, gunned down forty Christians this past February? No, no I did not thinking so. And by their logic, those CNN goofballs would have us believe that those same Muslims herdsmen are Trump supporting NRA members. Really? Prayers for all in this horrid execution of innocent people…. To the seasoned and groomed brown shirt….You are one disgusting human being. Not a day goes by without her radical politics and there are some right now likely sitting quietly alone somewhere just eating up Her rhetoric waiting for the right time. So sad what a body of “elected” officials have done to this country. I guess nobody told her that she’s only supposed to ridicule prayer when it’s offered in response to a bloodbath in the U.S.
We live in a sad world when idiots like this are given so much time in the media. Yes, I know we have to report. How much longer is she going to stay in office? She is clueless about everything. I have not heard one intelligent word come out of her mouth! I was thinking the same thing. She spews out confusing nonsense every time she opens her mouth. And of course, the news media keep sticking a microphone in front of her. I responded to AOC: You might want to ask PM Ardern (whom you greatly admire) how in their “gun free” country that these criminals got hold of enough weapons to kill 40 people! And the innocent people can’t protect themselves from predators. Well, it’s something I would expect from a three named person. Taurnil Thank you so much for that link, I haven’t laughed so hard in days!!! Doesn’t she have some casting call to show up for on the casting couch to decide who gets the next open New York Senate seat? Perhaps she should think of the lines on the script she’s reading before she mindlessly puppets them out for her masters because her approval rating is way underwater and only getting worse. CalvinCool Don’t discourage AOC from keeping up the trend. Good point. AOC! AOC! AOC! You GO GIRL! I would like a psychiatrist to tell me the clinical term for a person who believes she knows the answers to every question put before her, and is eager to share, believes it is her duty to share that knowledge about everything as often as she can. Because she knows, without a doubt, that she is always right. The closest I can come up with for AOC is “Delusions of Grandeur” but somehow it misses the mark. M’Lady @nc checks and balances, I see you have become a member of the nobility. Congratulations, when did that happen? Also, great comment, now you’ve got me wondering AOC’s psych diagnosis too. Paladin I did? WooHoo!!! This is the first I’ve heard of it, thanks for letting me know. No formal address is necessary though, a simple curtsy now and then will do! Being a member of the male persuasion, I hope a bow will do. See, Pal, I knew that. I guess I’m just not cut out for the nobility. Sure you are. The nobility are people, just people who are more equal than others, and IMO, you’re doing great. Represent, Sister! Paladin Aren’t you the sweetest! @nc checks and balances Why yes, yes I am. A dictator in-waiting, America’s Hugo Chavez; she is such a mastermind. I believe it’s called “being a leftist Democrat”. Wow, this “Thoughts and Prayers” tweet by AOC is the first one I’ve ever seen her get ratio’d on. Too bad she didn’t give up attacking America for Lent. AOC is an actress / puppet. The reason for the 2nd amendment is a tyrannical government. You AOC are the reason for the second amendment. I PRAY for a great awakening of Americans to the lying evil Satan disciples that is the Democratic Party and Left. I can still pray for enlightenment! I’m not ready to give up, no matter how despondent I am.